Abstract: To date, there is no standard third-line therapy for EGFR- and ALK-negative lung squamous cell carcinoma (SCC). Apatinib, an oral small-molecule VEGFR-2 inhibitor, has shown good therapeutic effect and safety in chemotherapy-refractory gastric cancer, but its efficacy in lung SCC is not determined. In this report, we present a 69-year-old Chinese man with locally advanced EGFR- and ALK-negative lung SCC, who received apatinib after failure of 2 treatment regimens. 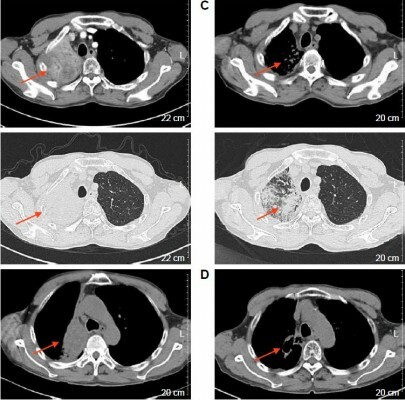 After 4 months of apatinib therapy, chest computed tomography scan showed a large cavity in the lung tumor, while there was minimal change in tumor size. The patient had quite a long progression-free survival time of over 17 months and tolerated apatinib very well. Apatinib provides an additional option for salvage treatment of lung SCC without driver gene mutations, but further large-scale clinical studies are still warranted.